Carl Clarke's Disco Bistro is back for four days in mid-July for a restaurant at artist Pure Evil's store in Leonard Street, EC2, for a mashed-up Cornish/Korean/Japanese menu, served alongside drinks from Ryan Chetiyawardana (Mr Lyan) with the Kraken Rum. There is also art to see, a bar to enjoy, and music from DJs like Don Letts in the evenings. Dinner is £49.50, and you can also go into the bar for free to drink and soak up the atmosphere. "Uniting London’s hottest talent across food, music, art and drinks, Unknown Pleasures, brings you a 4 day mind-blowing, sensory riot in the heart of Shoreditch. Itinerant chef Carl Clarke joins Yuya Kikuchi (Kirazu) creating a mashed-up Cornish/Korean/Japanese menu, served alongside epic drinks from Ryan Chetiyawardana (Mr Lyan) with the Kraken Rum. Charley Uzzell Edwards aka Pure Evil unveils an exclusive collection of previously unseen Andy Warhol and Jean Michel Basquiat artworks whilst beats are brought to you by Don Letts, Andrew Weatherall, Sophie Lloyd, DJ Kengo (Cuban Brothers) and Raf Daddy (2 Bears). Carl leads the way in experiential dining, known for his rebellious take on reinventing British cuisine with his punk-inspired Disco Bistro, Rock Lobsta, English Launderette and God Save the Clam dining concepts. 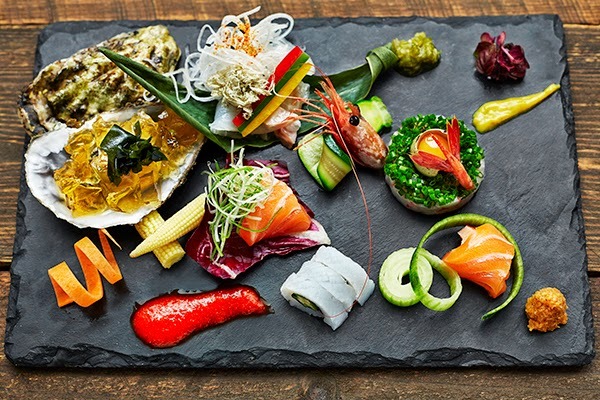 Yuya hails from sell-out Kirazu restaurant in Soho, serving Obanzi, traditional Japanese style home-cooking. Together they have knocked up a killer menu with snacks of ‘Bang Bang’ pigs ear noodles with chilli vinegar and explosive peanuts followed by 3 courses including 5 types of Cornish sashimi, Crackled duck with Gotchujan, smoked bone broth, apple kimchi and seaweed crack and finished with Amazake rice pudding and a little boozy treat of cocktail Smith & Sinclair cocktail jelly pastilles. Combining Yuya’s finesse and skill with Carl’s ‘no holds barred’ creativity, the Unknown Pleasure awaits. The 60 capacity restaurant is pre-book only, with a front-line chef’s table on the lower-ground floor to get fully involved. Ryan is famed for breaking barriers with his drinks, twice UK bartender of the year, he set up bars White Lyan in Hackney, Henry in New York and soon to launch Dandelyan at the new Mondrian Hotel, London. Mr Lyan is preparing a special selection of Kraken Rum cocktails to compliment the food, prepare your palate and match the music. The bar is open independently to the restaurant for walk ins so all can enjoy the drinks and vibe. Vedet beer and a selection of wines and Prosecco will also be served. Charley has unearthed an incredible collection of original Andy Warhol, Jean Michel Basquiat and Haring artwork from a private collector who travelled to New York in the late 80’s/90’s. Ranging from Polaroids taken by Basquiat of subway street art, screen test shots of a Warhol rentboy/cowboy film that was never made, authenticated by the Andy Warhol Museum in Pittsburgh to a Perfecto style Shott jacket painted by Haring in 1988 (he died the following year). Eclectic furniture suppliers The Mint List will be supplying a bespoke selection of tables and chairs sourced from a secret address book of suppliers. The mid-century and antique furniture will be used by diners in the gallery and all will be available to buy throughout the series of events. Jon Kahuna of FC Kahuna flexed his phone book to create the ultimate DJ line up for Unknown Pleasures. Punk-rock and reggae legend Don Letts, resident DJ at The Roxy Club ‘where it all started’, joins Andrew Weatherall electronic music pioneer and creator of Primal Scream’s ‘Screamadelica’ EP. East London disco darling Sophie Lloyd dons her sparkly hot pants whilst DJ Kengo does his ‘Cuban’ brothers proud with a hot-wired party set. Raf Daddy will be playing on Saturday night. Alongside Joe Goddard of Hot Chip they ruled the house-hit of last summer ‘Be Strong’, Raf’s pulsating rythms and soulful vocals mean that ‘2 Bears’ is in the house.